This publication is available to download for free by registering/logging in to this site. 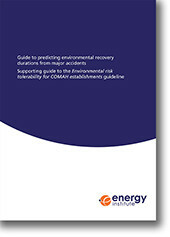 This guide has been produced in support of the Environmental risk tolerability for COMAH establishments guideline prepared by the Chemical and Downstream Oil Industries Forum (CDOIF). The CDOIF guideline promotes good practice environmental risk assessment for the development of site safety reports under the COMAH Regulations. The purpose of this guide is to be used alongside the guideline where risk assessors need to consider environmental recovery from a potential major accident at a particular industrial facility. Environmental risk assessment comprises two components – an assessment of the scale and severity of harm, and the duration of harm. This guide relates to the second part, an estimate of the time taken for an ecosystem to recover from a major accident. It can help an assessor to assign a recovery duration category to a major accident scenario once a chemical and a type of water or land-based habitat (that could be impacted by a major accident) has been identified.